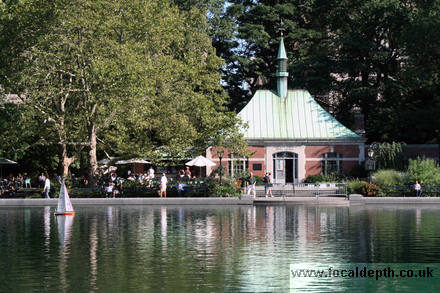 Conservatory Water was originally supposed to be next to a large iron and glass conservatory as proposed in the original Greensward Plan but the building was never constucted, probably due to lack of finance. A floral parterre here was replaced by an ornamental pool and over the years it has been used for ice skating and sailing model boats. It is now commonly called the boat pond as on Saturdays sailing races are held and boats can be rented from the Kerbs Memorial Boathouse nearby which was built in 1954. The regular enthusiasts can apply to stow their boats there. In front of the boathouse there is a large patio area with tables and chairs and you can buy light snacks and drinks from a counter near the boathouse. Plus, there are benches where you can sit and watch the activity on the water or just admire the view- it is a very relaxing, peaceful spot.